Guests of the Sheraton Hotel Zagreb will be located right in downtown Zagreb, so they'll be within easy walking distance of many of the city's attractions, both historical and modern. Guests of the hotel will be nearby to plenty of restaurants, clubs, entertainment venues, businesses, and shops, and they'll be close to the city's public transportation system. 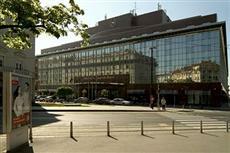 The Sheraton Hotel Zagreb is easily accessible by car, and guests can also get around town on the bus system. The rooms of the Sheraton Hotel Zagreb are all air conditioned, and all rooms include amenities like minibars, cable televisions, radios, and alarm clocks. The Sheraton Hotel Zagreb offers guests plenty of modern amenities, including an on-site restaurant, which specializes in Croatian foods and which serves international and local wines. The hotel also has a cafe and a bar, where guests can get drinks and snacks throughout the day. Those who are looking for a place to host large events can check out the hotel's Grand Ballroom, which can house plenty of people for a business event or private functions. The hotel also offers a fitness center, a steam bath, a sauna, a whirlpool, and a heated indoor pool.